The image of the innocent British soldier (or "Tommy") setting off with a spring in his step in 1914 to fight the "Great War" would not last long. Indeed that initial euphoria would soon give way to a deep-seated bitterness as these young men endured the horror of the First World War. 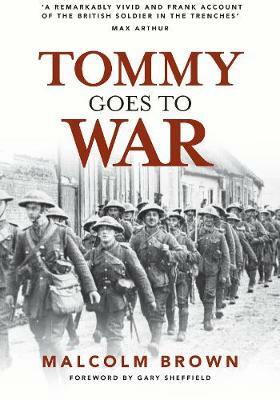 In a new edition of this extraordinary book, the uncensored letters, diaries, documents and many photographs tell the story of the British soldier (nicknamed Tommy) in their own words. While there are flashes of their wit and humour, the overwhelming feeling is that of a generation who felt let down by their superiors and left to perish. There are visceral, terrifying insights into life in the trenches and agonising descriptions of the squalor and privations of war. This haunting account also looks at the aggressive drive to recruit more soldiers through the Pals Battalion or Chum's Battalion. Friends from the same town or village; professional bodies, or work colleagues among others were encouraged to enlist en masse. They would fight together alongside their friends or colleagues. Many of them would sadly die together and leave communities wild with grief for a lost generation, robbed of a future having barely had a past. With a concise analysis of the British Army in the First World War, we are reminded of the terror of war, the fury, the fear and the frustration of what has been described by some as a war typified by the devastating assessment: "lions led by donkeys". Malcolm Brown studied at St John's College, Oxford. He spent his national service in the Royal Navy. He joined the BBC in 1955 and has been a documentary producer since 1980, specialising mainly in historical and biographical programmes. He has worked on many programmes including the landmark BBC documentary The Battle of the Somme. He co-authored the book Scapa Flow (1968). He died in December 2017.